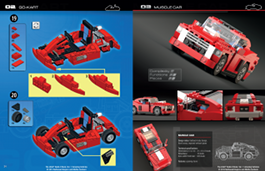 LEGO car building fans here is a nice “build-it” book on vehicles, The LEGO Build-It Book: Amazing Vehicles by Nathanaël Kuipers and Mattia Zamboni, No Starch Press 2013. If you are new to building with LEGO or building LEGO vehicles, there is a section: BUILDING BASICS, which offers tips and techniques; “Getting Creative with Parts,” shows how to use two simple LEGO parts in several different ways which can inspire one to think of other ways. Also, “How Bricks Fit Together” gives the reader a little “aha!” knowledge on how one can fit various bricks together to achieve a particular structure. In the ADVANCE BUILDING section, are techniques for making “Strong Connections” and “flexible joints and articulation points” for manually moveable parts on models (opening the hood or door of a car, a bulldozer, or crane). As for the models there are some simple builds, including not a car or truck, but yet a vehicle – a Stroller! Imagine what one can create from that! The authors included a nice variety of vehicles to build and be inspired by The final and 10th. model is the most intricate of all of them is the Rescue Truck. After building these models, your creativeness should zoom to build your own awesome vehicles. If you have a LEGO Pull-Back motor, incorporated it in your own model. Also, check out More Amazing Vehicles by Nathanaël Kuipers and Mattia Zamboni, No Starch Press coming September 2013. P.S. 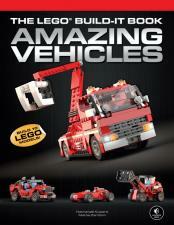 I was looking for a vehicle book to use with a possible Retired Seniors LEGO Club that I am planning to start in my community, The LEGO Build-It Book: Amazing Vehicles is perfect – it also comes in e-book format so I can put it on my iPad or computer to be enlarged on a large TV monitor.